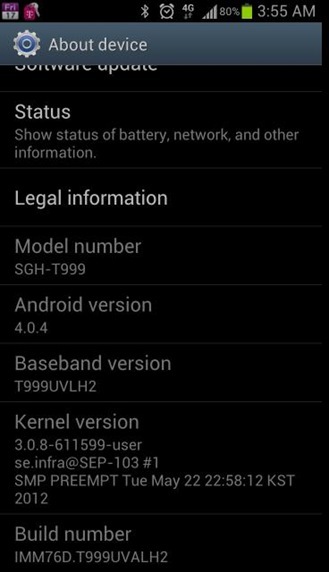 A minor update is available for T-Mobile's Samsung Galaxy S III which contains a few bug fixes that were present in the previous software as well as AllShare Cast and improvements to device performance and stability. The latest build, T999UVLH2, is currently rolling out to devices over-the-air, but if you can't update your phone yet, you will be able to get it using KIES instead. Resolved the error, ‘Enter MAC address' after entering the correct MAC address in the Mobile HotSpot configuration page if the MAC address entered did not contain the colons (:) or spaces. Resolved issue where the contents of a Home screen folder would be rearranged alphabetically after a reboot. Resolved issue where the name does not populate when trying to add a contact with NameID information, you must manually add. Aside from T-Mobile's official changelog, we're also hearing that the update brings a brightness slider, new modem, and new kernel. Unfortunately, it also removes universal search! The saga continues. Boo! For the full release notes and update instructions, head over to the documentation on T-Mobile's website.